The document's address is an absolute URL that is initially set when the Document is created but that can change during the lifetime of the Document, for example when the user navigates to a fragment identifier on the page or when the pushState() method is called with a new URL. Interactive user agents typically expose the document's address in their user interface. This is the primary mechanism by which a user can tell if a site is attempting to impersonate another. When a Document is created by a script using the createDocument() or createHTMLDocument() APIs, the document's address is the same as the document's address of the script's document, and the Document is both ready for post-load tasks and completely loaded immediately. Each Document object has a reload override flag that is originally unset. The flag is set by the document.open() and document.write() methods in certain situations. When the flag is set, the Document also has a reload override buffer which is a Unicode string that is used as the source of the document when it is reloaded. Let source be the value of the browsing context's active document's reload override buffer. Navigate the browsing context to a resource whose source is source, with replacement enabled. When the navigate algorithm creates a Document object for this purpose, set that Document's reload override flag and set its reload override buffer to source. User agents must throw a SecurityError exception whenever any properties of a Document object are accessed by scripts whose effective script origin is not the same as the Document's effective script origin. Returns the address of the Document from which the user navigated to this one, unless it was blocked or there was no such document, in which case it returns the empty string. The noreferrer link type can be used to block the referrer. The referrer attribute must return either the address of the active document of the source browsing context at the time the navigation was started (that is, the page which navigated the browsing context to the current document), with any <fragment> component removed; or the empty string if there is no such originating page, or if the UA has been configured not to report referrers in this case, or if the navigation was initiated for a hyperlink with a noreferrer keyword. In the case of HTTP, the referrer IDL attribute will match the Referer (sic) header that was sent when fetching the current page. Typically user agents are configured to not report referrers in the case where the referrer uses an encrypted protocol and the current page does not (e.g. when navigating from an https: page to an http: page). Returns the HTTP cookies that apply to the Document. If there are no cookies or cookies can't be applied to this resource, the empty string will be returned. Can be set, to add a new cookie to the element's set of HTTP cookies. If the contents are sandboxed into a unique origin (e.g. in an iframe with the sandbox attribute), a SecurityError exception will be thrown on getting and setting. The cookie attribute represents the cookies of the resource identified by the document's address. A Document that has no browsing context. A Document whose address does not use a server-based naming authority. Since the cookie attribute is accessible across frames, the path restrictions on cookies are only a tool to help manage which cookies are sent to which parts of the site, and are not in any way a security feature. Returns the date of the last modification to the document, as reported by the server, in the form "MM/DD/YYYY hh:mm:ss", in the user's local time zone. If the last modification date is not known, the current time is returned instead. The month component of the date. The day component of the date. The year component of the date. The hours component of the time. The minutes component of the time. The seconds component of the time. All the numeric components above, other than the year, must be given as two digits in the range ASCII digits representing the number in base ten, zero-padded if necessary. The year must be given as the shortest possible string of four or more digits in the range ASCII digits representing the number in base ten, zero-padded if necessary. The Document's source file's last modification date and time must be derived from relevant features of the networking protocols used, e.g. from the value of the HTTP Last-Modified header of the document, or from metadata in the file system for local files. If the last modification date and time are not known, the attribute must return the current date and time in the above format. Returns "loading" while the Document is loading, "interactive" once it is finished parsing but still loading sub-resources, and "complete" once it has loaded. The readystatechange event fires on the Document object when this value changes. Each document has a current document readiness. When a Document object is created, it must have its current document readiness set to the string "loading" if the document is associated with an HTML parser, an XML parser, or an XSLT processor, and to the string "complete" otherwise. Various algorithms during page loading affect this value. When the value is set, the user agent must fire a simple event named readystatechange at the Document object. A Document is said to have an active parser if it is associated with an HTML parser or an XML parser that has not yet been stopped or aborted. The readyState IDL attribute must, on getting, return the current document readiness. The html element of a document is the document's root element, if there is one and it's an html element, or null otherwise. The head element of a document is the first head element that is a child of the html element, if there is one, or null otherwise. The head attribute, on getting, must return the head element of the document (a head element or null). Returns the document's title, as given by the title element. Can be set, to update the document's title. If there is no head element, the new value is ignored. In SVG documents, the SVGDocument interface's title attribute takes precedence. The title element of a document is the first title element in the document (in tree order), if there is one, or null otherwise. Otherwise, let value be a concatenation of the data of all the child Text nodes of the title element, in tree order, or the empty string if the title element is null. Replace any sequence of one or more consecutive space characters in value with a single U+0020 SPACE character. Strip leading and trailing whitespace from value. On setting, the following algorithm must be run. Mutation events must be fired as appropriate. If the title element is null and the head element is null, then the attribute must do nothing. Stop the algorithm here. If the title element is null, then a new title element must be created and appended to the head element. Let element be that element. Otherwise, let element be the title element. The children of element (if any) must all be removed. A single Text node whose data is the new value being assigned must be appended to element. Can be set, to replace the body element. If the new value is not a body or frameset element, this will throw a HierarchyRequestError exception. The body element of a document is the first child of the html element that is either a body element or a frameset element. If there is no such element, it is null. If the new value is not a body or frameset element, then throw a HierarchyRequestError exception and abort these steps. Otherwise, if the new value is the same as the body element, do nothing. Abort these steps. Otherwise, if the body element is not null, then replace that element with the new value in the DOM, as if the root element's replaceChild() method had been called with the new value and the incumbent body element as its two arguments respectively, then abort these steps. Otherwise, the body element is null. Append the new value to the root element. Returns an HTMLCollection of the img elements in the Document. Return an HTMLCollection of the embed elements in the Document. Returns an HTMLCollection of the a and area elements in the Document that have href attributes. Return an HTMLCollection of the form elements in the Document. Return an HTMLCollection of the script elements in the Document. The images attribute must return an HTMLCollection rooted at the Document node, whose filter matches only img elements. The embeds attribute must return an HTMLCollection rooted at the Document node, whose filter matches only embed elements. The plugins attribute must return the same object as that returned by the embeds attribute. The links attribute must return an HTMLCollection rooted at the Document node, whose filter matches only a elements with href attributes and area elements with href attributes. The forms attribute must return an HTMLCollection rooted at the Document node, whose filter matches only form elements. The scripts attribute must return an HTMLCollection rooted at the Document node, whose filter matches only script elements. Returns a NodeList of elements in the Document that have a name attribute with the value name. The getElementsByName(name) method takes a string name, and must return a live NodeList containing all the HTML elements in that document that have a name attribute whose value is equal to the name argument (in a case-sensitive manner), in tree order. When the method is invoked on a Document object again with the same argument, the user agent may return the same as the object returned by the earlier call. In other cases, a new NodeList object must be returned. The Document interface supports named properties. The supported property names at any moment consist of the values of the name content attributes of all the applet, exposed embed, form, iframe, img, and exposed object elements in the Document that have name content attributes, and the values of the id content attributes of all the applet and exposed object elements in the Document that have id content attributes, and the values of the id content attributes of all the img elements in the Document that have both name content attributes and id content attributes. Let elements be the list of named elements with the name name in the Document. There will be at least one such element, by definition. If elements has only one element, and that element is an iframe element, then return the WindowProxy object of the nested browsing context represented by that iframe element, and abort these steps. Otherwise, if elements has only one element, return that element and abort these steps. Otherwise return an HTMLCollection rooted at the Document node, whose filter matches only named elements with the name name. img elements that have an id content attribute whose value is name, and that have a name content attribute present also. An embed or object element is said to be exposed if it has no exposed object ancestor, and, for object elements, is additionally either not showing its fallback content or has no object or embed descendants. The dir attribute on the Document interface is defined along with the dir content attribute. Let document be the XMLDocument object on which the method was invoked. Resolve the method's first argument, relative to the entry script's base URL. If this is not successful, throw a SyntaxError exception and abort these steps. Otherwise, let url be the resulting absolute URL. If the origin of url is not the same as the origin of document, throw a SecurityError exception and abort these steps. Remove all child nodes of document, without firing any mutation events. Run the remainder of these steps asynchronously, and return true from the method. Let result be a Document object. Fetch url from the origin of document, using the entry script's referrer source, with the synchronous flag set and the force same-origin flag set. Create a new XML parser associated with the result document. Pass this parser the fetched document. If there is an XML well-formedness or XML namespace well-formedness error, then remove all child nodes from result. Otherwise let success be true. Queue a task to run the following steps. Set the current document readiness of document to "complete". Replace all the children of document by the children of result (even if it has no children), firing mutation events as if a DocumentFragment containing the new children had been inserted. Fire a simple event named load at document. Elements, attributes, and attribute values in HTML are defined (by this specification) to have certain meanings (semantics). For example, the ol element represents an ordered list, and the lang attribute represents the language of the content. These definitions allow HTML processors, such as Web browsers or search engines, to present and use documents and applications in a wide variety of contexts that the author might not have considered. As a simple example, consider a Web page written by an author who only considered desktop computer Web browsers. Because HTML conveys meaning, rather than presentation, the same page can also be used by a small browser on a mobile phone, without any change to the page. Instead of headings being in large letters as on the desktop, for example, the browser on the mobile phone might use the same size text for the whole the page, but with the headings in bold. But it goes further than just differences in screen size: the same page could equally be used by a blind user using a browser based around speech synthesis, which instead of displaying the page on a screen, reads the page to the user, e.g. using headphones. Instead of large text for the headings, the speech browser might use a different volume or a slower voice. That's not all, either. Since the browsers know which parts of the page are the headings, they can create a document outline that the user can use to quickly navigate around the document, using keys for "jump to next heading" or "jump to previous heading". Such features are especially common with speech browsers, where users would otherwise find quickly navigating a page quite difficult. Even beyond browsers, software can make use of this information. Search engines can use the headings to more effectively index a page, or to provide quick links to subsections of the page from their results. Tools can use the headings to create a table of contents (that is in fact how this very specification's table of contents is generated). Authors must not use elements, attributes, or attribute values for purposes other than their appropriate intended semantic purpose, as doing so prevents software from correctly processing the page. ...because the data placed in the cells is clearly not tabular data (and the cite element mis-used). This would make software that relies on these semantics fail: for example, a speech browser that allowed a blind user to navigate tables in the document would report the quote above as a table, confusing the user; similarly, a tool that extracted titles of works from pages would extract "Ernest" as the title of a work, even though it's actually a person's name, not a title. This next document fragment, intended to represent the heading of a corporate site, is similarly non-conforming because the second line is not intended to be a heading of a subsection, but merely a subheading or subtitle (a subordinate heading for the same section). Authors must not use elements, attributes, or attribute values that are not permitted by this specification or other applicable specifications, as doing so makes it significantly harder for the language to be extended in the future. Through scripting and using other mechanisms, the values of attributes, text, and indeed the entire structure of the document may change dynamically while a user agent is processing it. The semantics of a document at an instant in time are those represented by the state of the document at that instant in time, and the semantics of a document can therefore change over time. User agents must update their presentation of the document as this occurs. HTML has a progress element that describes a progress bar. If its "value" attribute is dynamically updated by a script, the UA would update the rendering to show the progress changing. The nodes representing HTML elements in the DOM must implement, and expose to scripts, the interfaces listed for them in the relevant sections of this specification. This includes HTML elements in XML documents, even when those documents are in another context (e.g. inside an XSLT transform). Elements in the DOM represent things; that is, they have intrinsic meaning, also known as semantics. For example, an ol element represents an ordered list. The basic interface, from which all the HTML elements' interfaces inherit, and which must be used by elements that have no additional requirements, is the HTMLElement interface. The HTMLElement interface holds methods and attributes related to a number of disparate features, and the members of this interface are therefore described in various different sections of this specification. The HTMLUnknownElement interface must be used for HTML elements that are not defined by this specification (or other applicable specifications). These attributes are only defined by this specification as attributes for HTML elements. When this specification refers to elements having these attributes, elements from namespaces that are not defined as having these attributes must not be considered as being elements with these attributes. For example, in the following XML fragment, the "bogus" element does not have a dir attribute as defined in this specification, despite having an attribute with the literal name "dir". Thus, the directionality of the inner-most span element is 'rtl', inherited from the div element indirectly through the "bogus" element. The attributes marked with an asterisk have a different meaning when specified on body elements as those elements expose event handlers of the Window object with the same names. While these attributes apply to all elements, they are not useful on all elements. For example, only media elements will ever receive a volumechange event fired by the user agent. Custom data attributes (e.g. data-foldername or data-msgid) can be specified on any HTML element, to store custom data specific to the page. In HTML documents, elements in the HTML namespace may have an xmlns attribute specified, if, and only if, it has the exact value "http://www.w3.org/1999/xhtml". This does not apply to XML documents. In HTML, the xmlns attribute has absolutely no effect. It is basically a talisman. It is allowed merely to make migration to and from XHTML mildly easier. When parsed by an HTML parser, the attribute ends up in no namespace, not the "http://www.w3.org/2000/xmlns/" namespace like namespace declaration attributes in XML do. In XML, an xmlns attribute is part of the namespace declaration mechanism, and an element cannot actually have an xmlns attribute in no namespace specified. There is no way to serialize the xml:space attribute on HTML elements in the text/html syntax. To enable assistive technology products to expose a more fine-grained interface than is otherwise possible with HTML elements and attributes, a set of annotations for assistive technology products can be specified (the ARIA role and aria-* attributes). An element's unique identifier can be used for a variety of purposes, most notably as a way to link to specific parts of a document using fragment identifiers, as a way to target an element when scripting, and as a way to style a specific element from CSS. Identifiers are opaque strings. Particular meanings should not be derived from the value of the id attribute. The title attribute represents advisory information for the element, such as would be appropriate for a tooltip. On a link, this could be the title or a description of the target resource; on an image, it could be the image credit or a description of the image; on a paragraph, it could be a footnote or commentary on the text; on a citation, it could be further information about the source; on interactive content, it could be a label for, or instructions for, use of the element; and so forth. The value is text. Relying on the title attribute is currently discouraged as many user agents do not expose the attribute in an accessible manner as required by this specification (e.g. requiring a pointing device such as a mouse to cause a tooltip to apear, which excludes keyboard-only users and touch-only users, such as anyone with a modern phone or tablet). If this attribute is omitted from an element, then it implies that the title attribute of the nearest ancestor HTML element with a title attribute set is also relevant to this element. Setting the attribute overrides this, explicitly stating that the advisory information of any ancestors is not relevant to this element. Setting the attribute to the empty string indicates that the element has no advisory information. If the title attribute's value contains "LF" (U+000A) characters, the content is split into multiple lines. Each "LF" (U+000A) character represents a line break. Caution is advised with respect to the use of newlines in title attributes. Some elements, such as link, abbr, and input, define additional semantics for the title attribute beyond the semantics described above. The advisory information of an element is the value that the following algorithm returns, with the algorithm being aborted once a value is returned. When the algorithm returns the empty string, then there is no advisory information. If the element is a link, style, dfn, abbr, or title element, then: if the element has a title attribute, return the value of that attribute, otherwise, return the empty string. Otherwise, if the element has a title attribute, then return its value. Otherwise, if the element has a parent element, then return the parent element's advisory information. User agents should inform the user when elements have advisory information, otherwise the information would not be discoverable. The title IDL attribute must reflect the title content attribute. If these attributes are omitted from an element, then the language of this element is the same as the language of its parent element, if any. The lang attribute in no namespace may be used on any HTML element. The lang attribute in the XML namespace may be used on HTML elements in XML documents, as well as elements in other namespaces if the relevant specifications allow it (in particular, MathML and SVG allow lang attributes in the XML namespace to be specified on their elements). If both the lang attribute in no namespace and the lang attribute in the XML namespace are specified on the same element, they must have exactly the same value when compared in an ASCII case-insensitive manner. Authors must not use the lang attribute in the XML namespace on HTML elements in HTML documents. To ease migration to and from XHTML, authors may specify an attribute in no namespace with no prefix and with the literal localname "xml:lang" on HTML elements in HTML documents, but such attributes must only be specified if a lang attribute in no namespace is also specified, and both attributes must have the same value when compared in an ASCII case-insensitive manner. The attribute in no namespace with no prefix and with the literal localname "xml:lang" has no effect on language processing. To determine the language of a node, user agents must look at the nearest ancestor element (including the element itself if the node is an element) that has a lang attribute in the XML namespace set or is an HTML element and has a lang in no namespace attribute set. That attribute specifies the language of the node (regardless of its value). If both the lang attribute in no namespace and the lang attribute in the XML namespace are set on an element, user agents must use the lang attribute in the XML namespace, and the lang attribute in no namespace must be ignored for the purposes of determining the element's language. If neither the node nor any of the node's ancestors, including the root element, have either attribute set, but there is a pragma-set default language set, then that is the language of the node. If there is no pragma-set default language set, then language information from a higher-level protocol (such as HTTP), if any, must be used as the final fallback language instead. In the absence of any such language information, and in cases where the higher-level protocol reports multiple languages, the language of the node is unknown, and the corresponding language tag is the empty string. If the resulting value is not a recognized language tag, then it must be treated as an unknown language having the given language tag, distinct from all other languages. For the purposes of round-tripping or communicating with other services that expect language tags, user agents should pass unknown language tags through unmodified. Thus, for instance, an element with lang="xyzzy" would be matched by the selector :lang(xyzzy) (e.g. in CSS), but it would not be matched by :lang(abcde), even though both are equally invalid. Similarly, if a Web browser and screen reader working in unison communicated about the language of the element, the browser would tell the screen reader that the language was "xyzzy", even if it knew it was invalid, just in case the screen reader actually supported a language with that tag after all. If the resulting value is the empty string, then it must be interpreted as meaning that the language of the node is explicitly unknown. User agents may use the element's language to determine proper processing or rendering (e.g. in the selection of appropriate fonts or pronunciations, for dictionary selection, or for the user interfaces of form controls such as date pickers). The lang IDL attribute must reflect the lang content attribute in no namespace. The translate attribute is an enumerated attribute that is used to specify whether an element's attribute values and the values of its Text node children are to be translated when the page is localized, or whether to leave them unchanged. The attribute's keywords are the empty string, yes, and no. The empty string and the yes keyword map to the yes state. The no keyword maps to the no state. In addition, there is a third state, the inherit state, which is the missing value default (and the invalid value default). Each element has a translation mode, which is in either the translate-enabled state or the no-translate state. If the element's translate attribute is in the yes state, then the element's translation mode is in the translate-enabled state. Otherwise, if the element's translate attribute is in the no state, then the element's translation mode is in the no-translate state. Otherwise, the element's translate attribute is in the inherit state; in that case, the element's translation mode is in the same state as its parent element, if any, or in the translate-enabled state, if the element is a root element. When an element is in the translate-enabled state, the element's attribute values and the values of its Text node children are to be translated when the page is localized. When an element is in the no-translate state, the element's attribute values and the values of its Text node children are to be left as-is when the page is localized, e.g. because the element contains a person's name or a the name of a computer program. The translate IDL attribute must, on getting, return true if the element's translation mode is translate-enabled, and false otherwise. On setting, it must set the content attribute's value to "yes" if the new value is true, and set the content attribute's value to "no" otherwise. The xml:base attribute may be used on HTML elements of XML documents. Authors must not use the xml:base attribute on HTML elements in HTML documents. Indicates that the contents of the element are explicitly directionally embedded left-to-right text. Indicates that the contents of the element are explicitly directionally embedded right-to-left text. Indicates that the contents of the element are explicitly embedded text, but that the direction is to be determined programmatically using the contents of the element (as described below). For textarea and pre elements, the heuristic is applied on a per-paragraph level. The attribute has no invalid value default and no missing value default. The directionality of the element is 'ltr'. The directionality of the element is 'rtl'. The character is from a Text node that is a descendant of the element whose directionality is being determined. An element with a dir attribute in a defined state. If such a character is found and it is of bidirectional character type AL or R, the directionality of the element is 'rtl'. Otherwise, the directionality of the element is 'ltr'. The directionality of the element is the same as the element's parent element's directionality. The effect of this attribute is primarily on the presentation layer. For example, the rendering section in this specification defines a mapping from this attribute to the CSS 'direction' and 'unicode-bidi' properties, and CSS defines rendering in terms of those properties. Returns the html element's dir attribute's value, if any. Can be set, to either "ltr", "rtl", or "auto" to replace the html element's dir attribute's value. If there is no html element, returns the empty string and ignores new values. The dir IDL attribute on an element must reflect the dir content attribute of that element, limited to only known values. The dir IDL attribute on Document objects must reflect the dir content attribute of the html element, if any, limited to only known values. If there is no such element, then the attribute must return the empty string and do nothing on setting. Authors are strongly encouraged to use the dir attribute to indicate text direction rather than using CSS, since that way their documents will continue to render correctly even in the absence of CSS (e.g. as interpreted by search engines). This markup fragment is of an IM conversation. As noted earlier, the auto value is not a panacea. The final paragraph in this example is misinterpreted as being right-to-left text, since it begins with an Arabic character, which causes the "right?" to be to the left of the Arabic text. Documents that use style attributes on any of their elements must still be comprehensible and usable if those attributes were removed. Returns a CSSStyleDeclaration object for the element's style attribute. In the following example, the words that refer to colors are marked up using the span element and the style attribute to make those words show up in the relevant colors in visual media. A custom data attribute is an attribute in no namespace whose name starts with the string "data-", has at least one character after the hyphen, is XML-compatible, and contains no characters in the range U+0041 to U+005A (LATIN CAPITAL LETTER A to LATIN CAPITAL LETTER Z). All attribute names on HTML elements in HTML documents get ASCII-lowercased automatically, so the restriction on ASCII uppercase letters doesn't affect such documents. For instance, a site about music could annotate list items representing tracks in an album with custom data attributes containing the length of each track. This information could then be used by the site itself to allow the user to sort the list by track length, or to filter the list for tracks of certain lengths. It would be inappropriate, however, for the user to use generic software not associated with that music site to search for tracks of a certain length by looking at this data. This is because these attributes are intended for use by the site's own scripts, and are not a generic extension mechanism for publicly-usable metadata. Returns a DOMStringMap object for the element's data-* attributes. Hyphenated names become camel-cased. For example, data-foo-bar="" becomes element.dataset.fooBar. Let list be an empty list of name-value pairs. For each content attribute on the element whose first five characters are the string "data-" and whose remaining characters (if any) do not include any characters in the range U+0041 to U+005A (LATIN CAPITAL LETTER A to LATIN CAPITAL LETTER Z), add a name-value pair to list whose name is the attribute's name with the first five characters removed and whose value is the attribute's value. For each name list, for each "-" (U+002D) character in the name that is followed by a character in the range U+0061 to U+007A (lowercase ASCII letters), remove the "-" (U+002D) character and replace the character that followed it by the same character converted to ASCII uppercase. Let name be the name passed to the algorithm. Let value be the value passed to the algorithm. If name contains a "-" (U+002D) character followed by a character in the range U+0061 to U+007A (lowercase ASCII letters), throw a SyntaxError exception and abort these steps. For each character in the range U+0041 to U+005A (uppercase ASCII letters) in name, insert a "-" (U+002D) character before the character and replace the character with the same character converted to ASCII lowercase. Insert the string data- at the front of name. Set the value of the attribute with the name name, to the value value, replacing any previous value if the attribute already existed. If setAttribute() would have thrown an exception when setting an attribute with the name name, then this must throw the same exception. Remove the attribute with the name name, if such an attribute exists. Do nothing otherwise. Notice how the hyphenated attribute name becomes camel-cased in the API. Authors should carefully design such extensions so that when the attributes are ignored and any associated CSS dropped, the page is still usable. User agents must not derive any implementation behavior from these attributes or values. Specifications intended for user agents must not define these attributes to have any meaningful values. For example, a library called "DoQuery" could use attribute names like data-doquery-range, and a library called "jJo" could use attributes names like data-jjo-range. The jJo library could also provide an API to set which prefix to use (e.g. J.setDataPrefix('j2'), making the attributes have names like data-j2-range). A list of categories to which the element belongs. These are used when defining the content models for each element. A non-normative description of where the element can be used. This information is redundant with the content models of elements that allow this one as a child, and is provided only as a convenience. For simplicity, only the most specific expectations are listed. 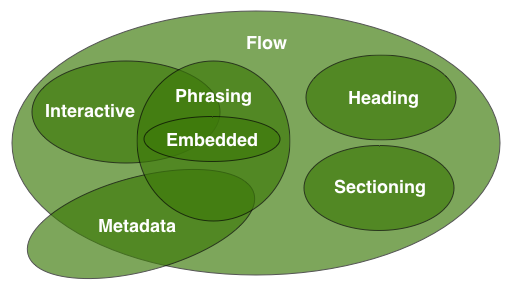 For example, an element that is both flow content and phrasing content can be used anywhere that either flow content or phrasing content is expected, but since anywhere that flow content is expected, phrasing content is also expected (since all phrasing content is flow content), only "where phrasing content is expected" will be listed. A normative description of what content must be included as children and descendants of the element. A normative list of attributes that may be specified on the element (except where otherwise disallowed). This is then followed by a description of what the element represents, along with any additional normative conformance criteria that may apply to authors and implementations. Examples are sometimes also included. Except where otherwise specified, attributes on HTML elements may have any string value, including the empty string. Except where explicitly stated, there is no restriction on what text can be specified in such attributes. Certain elements in HTML have an activation behavior, which means that the user can activate them. This triggers a sequence of events dependent on the activation mechanism, and normally culminating in a click event, as described below. The user agent should allow the user to manually trigger elements that have an activation behavior, for instance using keyboard or voice input, or through mouse clicks. When the user triggers an element with a defined activation behavior in a manner other than clicking it, the default action of the interaction event must be to run synthetic click activation steps on the element. Each element has a click in progress flag, initially set to false. If the element's click in progress flag is set to true, then abort these steps. Set the click in progress flag on the element to true. Run pre-click activation steps on the element. Fire a click event at the element. If the run synthetic click activation steps algorithm was invoked because the click() method was invoked, then the isTrusted attribute must be initialized to false. If this click event is not canceled, run post-click activation steps on the element. If the event is canceled, the user agent must run canceled activation steps on the element instead. Set the click in progress flag on the element to false. Let e be the nearest activatable element of the element designated by the user (defined below), if any. Dispatch the required click event. If there is an element e and the click event is not canceled, run post-click activation steps on element e.
If there is an element e and the event is canceled, run canceled activation steps on element e.
The above doesn't happen for arbitrary synthetic events dispatched by author script. However, the click() method can be used to make it happen programmatically. Click-focusing behavior (e.g. the focusing of a text field when user clicks in one) typically happens before the click, when the mouse button is first depressed, and is therefore not discussed here. When a user agent is to run pre-click activation steps on an element, it must run the pre-click activation steps defined for that element, if any. When a user agent is to run canceled activation steps on an element, it must run the canceled activation steps defined for that element, if any. When a user agent is to run post-click activation steps on an element, it must run the activation behavior defined for that element, if any. Activation behaviors can refer to the click event that was fired by the steps above leading up to this point. To check whether "Apples" is allowed inside the a element, the content models are examined. The a element's content model is transparent, as is the map element's, as is the ins element's. The ins element is found in the p element, whose content model is phrasing content. Thus, "Apples" is allowed, as text is phrasing content. Conformance checkers may warn authors of cases where they have paragraphs that overlap each other (this can happen with object, video, audio, and canvas elements, and indirectly through elements in other namespaces that allow HTML to be further embedded therein, like svg or math). You can play with my fish simulator. The aforementioned restrictions are defined by specifying that certain parts of documents form bidirectional-algorithm formatting character ranges, and then imposing a requirement on such ranges. Let output be an empty list of strings. Let string be an empty string. Let node be the first child node of element, if any, or null otherwise. Loop: If node is null, jump to the step labeled end. Append the text data of node to string. If string is not the empty string, push string onto output, and let string be empty string. Let node be node's next sibling, if any, or null otherwise. Jump to the step labeled loop. End: If string is not the empty string, push string onto output. Return output as the bidirectional-algorithm formatting character ranges. The value of a namespace-less attribute of an HTML element is a bidirectional-algorithm formatting character range. Authors are encouraged to use the dir attribute, the bdo element, and the bdi element, rather than maintaining the bidirectional-algorithm formatting characters manually. The bidirectional-algorithm formatting characters interact poorly with CSS. Every HTML element may have an ARIA role attribute specified. This is an ARIA Role attribute as defined by [ARIA] Section 5.4 Definition of Roles. The attribute, if specified, must have a value that is a set of space-separated tokens representing the various WAI-ARIA roles that the element belongs to. The WAI-ARIA role that an HTML element has assigned to it is the first non-abstract role found in the list of values generated when the role attribute is split on spaces. Every HTML element may have ARIA state and property attributes specified. These attributes are defined by [ARIA] in Section 6.6, Definitions of States and Properties (all aria-* attributes). These attributes, if specified, must have a value that is the ARIA value type in the "Value" field of the definition for the state or property, mapped to the appropriate HTML value type according to [ARIA] Section 10.2 Mapping WAI-ARIA Value types to languages using the HTML 5 mapping. ARIA State and Property attributes can be used on any element. They are not always meaningful, however, and in such cases user agents might not perform any processing aside from including them in the DOM. State and property attributes are processed according to the requirements of the sections Strong Native Semantics and Implicit ARIA semantics, as well as [ARIA] and [ARIAIMPL]. The WAI-ARIA specification neither requires or forbids user agents from enhancing native presentation and interaction behaviors on the basis of WAI- ARIA markup. Even mainstream user agents might choose to expose metadata or navigational features directly or via user-installed extensions; for example, exposing required form fields or landmark navigation. User agents are encouraged to maximize their usefulness to users, including users without disabilities. Implementations of XPath 1.0 that operate on HTML documents parsed or created in the manners described in this specification (e.g. as part of the document.evaluate() API) must act as if the following edit was applied to the XPath 1.0 specification. A QName in the node test is expanded into an expanded-name using the namespace declarations from the expression context. This is the same way expansion is done for element type names in start and end-tags except that the default namespace declared with xmlns is not used: if the QName does not have a prefix, then the namespace URI is null (this is the same way attribute names are expanded). It is an error if the QName has a prefix for which there is no namespace declaration in the expression context. A QName in the node test is expanded into an expanded-name using the namespace declarations from the expression context. If the QName has a prefix, then there must be a namespace declaration for this prefix in the expression context, and the corresponding namespace URI is the one that is associated with this prefix. It is an error if the QName has a prefix for which there is no namespace declaration in the expression context. If the context node is from an HTML DOM, the default element namespace is "http://www.w3.org/1999/xhtml". Otherwise, the default element namespace URI is null. This is equivalent to adding the default element namespace feature of XPath 2.0 to XPath 1.0, and using the HTML namespace as the default element namespace for HTML documents. It is motivated by the desire to have implementations be compatible with legacy HTML content while still supporting the changes that this specification introduces to HTML regarding the namespace used for HTML elements, and by the desire to use XPath 1.0 rather than XPath 2.0. If the transformation program outputs an element in no namespace, the processor must, prior to constructing the corresponding DOM element node, change the namespace of the element to the HTML namespace, ASCII-lowercase the element's local name, and ASCII-lowercase the names of any non-namespaced attributes on the element. This specification does not specify precisely how XSLT processing interacts with the HTML parser infrastructure (for example, whether an XSLT processor acts as if it puts any elements into a stack of open elements). However, XSLT processors must stop parsing if they successfully complete, and must set the current document readiness first to "interactive" and then to "complete" if they are aborted. This specification does not specify how XSLT interacts with the navigation algorithm, how it fits in with the event loop, nor how error pages are to be handled (e.g. whether XSLT errors are to replace an incremental XSLT output, or are rendered inline, etc). There are also additional non-normative comments regarding the interaction of XSLT and HTML in the script element section. APIs for dynamically inserting markup into the document interact with the parser, and thus their behavior varies depending on whether they are used with HTML documents (and the HTML parser) or XHTML in XML documents (and the XML parser). The open() method comes in several variants with different numbers of arguments. If the type argument is omitted or has the value "text/html", then the resulting Document has an HTML parser associated with it, which can be given data to parse using document.write(). Otherwise, all content passed to document.write() will be parsed as plain text. If the replace argument is present and has the value "replace", the existing entries in the session history for the Document object are removed. Throws an InvalidStateError exception if the Document is an XML document. If the Document object is not flagged as an HTML document, throw an InvalidStateError exception and abort these steps. Let type be the value of the first argument, if there is one, or "text/html" otherwise. Let replace be true if there is a second argument and it is an ASCII case-insensitive match for the value "replace", and false otherwise. If the Document has an active parser that isn't a script-created parser, and the insertion point associated with that parser's input stream is not undefined (that is, it does point to somewhere in the input stream), then the method does nothing. Abort these steps and return the Document object on which the method was invoked. This basically causes document.open() to be ignored when it's called in an inline script found during the parsing of data sent over the network, while still letting it have an effect when called asynchronously or on a document that is itself being spoon-fed using these APIs. Similarly, if the Document's ignore-opens-during-unload counter is greater than zero, then the method does nothing. Abort these steps and return the Document object on which the method was invoked. This basically causes document.open() to be ignored when it's called from a beforeunload pagehide, or unload event handler while the Document is being unloaded. Prompt to unload the Document object. If the user refused to allow the document to be unloaded, then abort these steps and return the Document object on which the method was invoked. Unload the Document object, with the recycle parameter set to true. Unregister all event listeners registered on the Document node and its descendants. Remove any tasks associated with the Document in any task source. Remove all child nodes of the document, without firing any mutation events. Change the document's character encoding to UTF-8. Set the Document object's reload override flag and set the Document's reload override buffer to the empty string. Set the Document's salvageable state back to true. Change the document's address to the entry script's document's address. Create a new HTML parser and associate it with the document. This is a script-created parser (meaning that it can be closed by the document.open() and document.close() methods, and that the tokenizer will wait for an explicit call to document.close() before emitting an end-of-file token). The encoding confidence is irrelevant. Set the current document readiness of the document to "loading". If the type string contains a ";" (U+003B) character, remove the first such character and all characters from it up to the end of the string. Strip leading and trailing whitespace from type. If type is not now an ASCII case-insensitive match for the string "text/html", then act as if the tokenizer had emitted a start tag token with the tag name "pre" followed by a single "LF" (U+000A) character, then switch the HTML parser's tokenizer to the PLAINTEXT state. Remove any earlier entries that share the same Document. If replace is false, then add a new entry, just before the last entry, and associate with the new entry the text that was parsed by the previous parser associated with the Document object, as well as the state of the document at the start of these steps. This allows the user to step backwards in the session history to see the page before it was blown away by the document.open() call. This new entry does not have a Document object, so a new one will be created if the session history is traversed to that entry. Return the Document on which the method was invoked. The document.open() method does not affect whether a Document is ready for post-load tasks or completely loaded. When called with three or more arguments, the open() method on the Document object must call the open() method on the Window object of the Document object, with the same arguments as the original call to the open() method, and return whatever that method returned. If the Document object has no Window object, then the method must throw an InvalidAccessError exception. If there is no script-created parser associated with the document, then abort these steps. If there is a pending parsing-blocking script, then abort these steps. This method has very idiosyncratic behavior. In some cases, this method can affect the state of the HTML parser while the parser is running, resulting in a DOM that does not correspond to the source of the document (e.g. if the string written is the string "<plaintext>" or "<!--"). In other cases, the call can clear the current page first, as if document.open() had been called. In yet more cases, the method is simply ignored, or throws an exception. To make matters worse, the exact behavior of this method can in some cases be dependent on network latency, which can lead to failures that are very hard to debug. For all these reasons, use of this method is strongly discouraged. This method throws an InvalidStateError exception when invoked on XML documents. If the method was invoked on an XML document, throw an InvalidStateError exception and abort these steps. If the insertion point is undefined and either the Document's ignore-opens-during-unload counter is greater than zero or the Document's ignore-destructive-writes counter is greater than zero, abort these steps. If the insertion point is undefined, call the open() method on the document object (with no arguments). If the user refused to allow the document to be unloaded, then abort these steps. Otherwise, the insertion point will point at just before the end of the (empty) input stream. Insert the string consisting of the concatenation of all the arguments to the method into the input stream just before the insertion point. If the Document object's reload override flag is set, then append the string consisting of the concatenation of all the arguments to the method to the Document's reload override buffer. If there is no pending parsing-blocking script, have the HTML parser process the characters that were inserted, one at a time, processing resulting tokens as they are emitted, and stopping when the tokenizer reaches the insertion point or when the processing of the tokenizer is aborted by the tree construction stage (this can happen if a script end tag token is emitted by the tokenizer). If the document.write() method was called from script executing inline (i.e. executing because the parser parsed a set of script tags), then this is a reentrant invocation of the parser. Finally, return from the method. The document.writeln(...) method, when invoked, must act as if the document.write() method had been invoked with the same argument(s), plus an extra argument consisting of a string containing a single line feed character (U+000A).